Wall cloud on tornado warned storm near Independence, IA right as storm merger was starting to take place. Storm near Independence, IA while new flanking line towers started to go up. Nice mammatus on western side of storm. 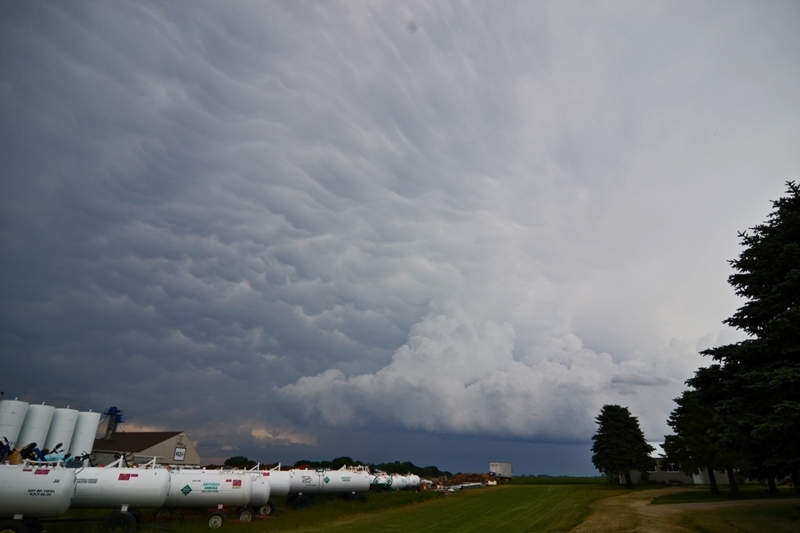 Heading west on Hwy 20 looking back at our initial storm with new updraft and mammatus near Jessup, IA. Large rotating, low mesocyclone on tornado warned storm near Allison, IA. Bowl lowering in the rain shaft to the left of the road on tornado warned storm near Allison, IA. 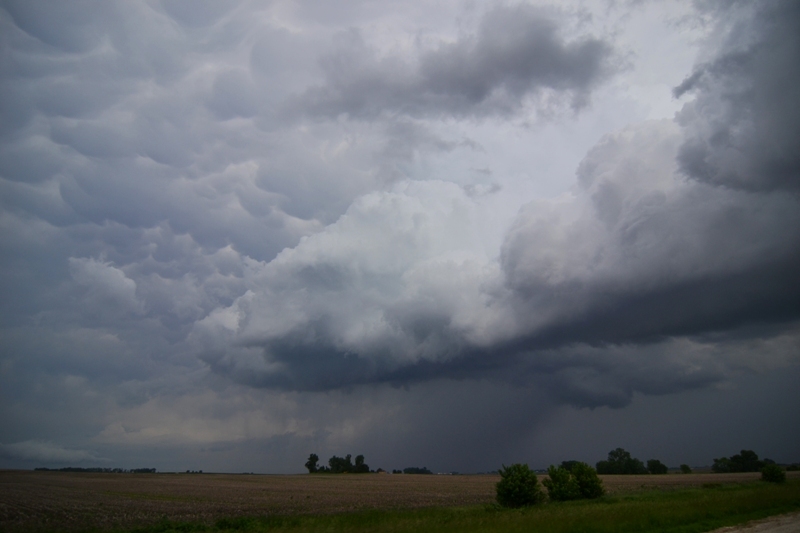 Lowering on the left side of the photo with noticeable inflow bands feeding into the storm near Shell Rock, IA. Awesome shelf cloud at the end of the day near Readlyn, IA. 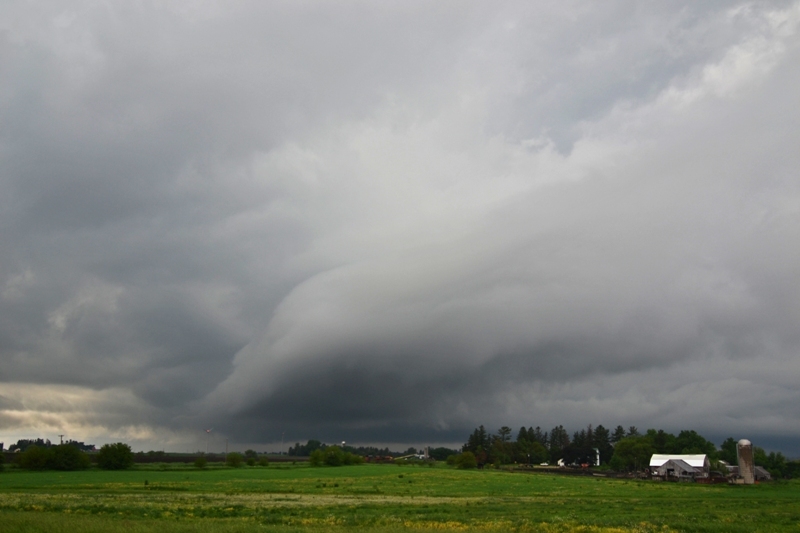 Another shot of the shelf cloud near Readlyn, IA as it was about to overtake us. This was an event that I had no intentions on chasing as the thought was that the system would be too far east and would be more of a damaging wind/squall line threat. But after looking at things around the lunch hour and seeing a favorable tornado set-up, I decided to make a run for it. There was a deepening surface low over central IA and a frontal boundary eastward into northeast IA and along the IL/WI border. The environment was characterized by moderate to strong instability with MLCAPE ranging from 2,000 j/kg over central IA to 4,000 j/kg over eastern IA and northern IL. Deep layer shear across the area was in the 50-60 kt range and low level shear was fairly impressive, although surface winds south of the boundary were turning more southwesterly leading up to storm initiation. An upper level impulse approached from the west, which allowed storms to initiate across central and eastern IA by mid afternoon. As we progressed south along Hwy 52 from MN into northeast IA, SPC issued a PDS Tornado Watch at 1:50 PM CDT, highlighting the risk for strong tornadoes with any discrete storms initially and then a bow echo/derecho scenario setting up into the overnight as storms progressed further to the east. Already behind the game, we encountered numerous areas of road construction that slowed us down along the way as we headed due south on Hwy 52 from Decorah down to West Union, IA as storms were already developing along the boundary just to the north of Hwy 20. We finally were able to get on our first storm, which happened to be tornado warned, on Hwy 150 north if Independence. This storm had a nice wall cloud on it, but struggled after merging with another cell to the south. We waited in Independence to see what would happen after the cell merger; all the while a storm near Hampton to our west near I-35 was producing multiple elephant trunk tornadoes. This was very frustrating as we were not able to make it to these storms that happened to be right on the triple point. I felt like I made a mistake in not going further west, directly towards the triple point, but I did think the low would move along the boundary, which it didn’t, and the environment further to the east appeared to be much better than the western environment. 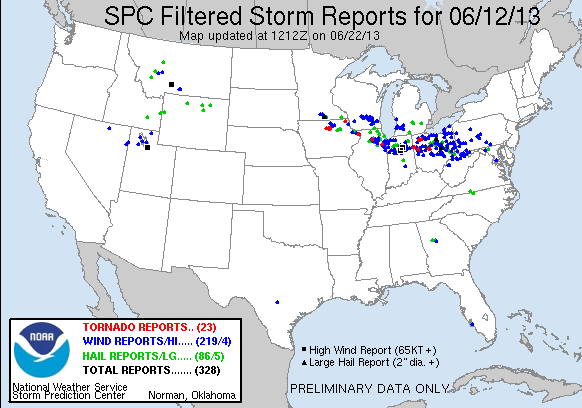 Lesson learned: Never doubt a triple point storm! They just happen to produce magic, even if you don’t expect it. Anyways, back to the storm we were on near Independence…it could not get its act together after the cell merger and echo tops continued to drop and the radar presentation was looking horrible, although the storm was photogenic as we watched in a gas station parking lot and then as we traveled west on Hwy 20. We did bail on this storm and got on another tornado warned storm just to the northeast of Waterloo. This storm also had a really nice, ground dragging lowering on it, but also weakened soon afterward. At this point, we were getting quite frustrated as it seemed like storms were weakening right as we got on them. Our last effort came with yet another tornado warned storm we intercepted between Allison and Shell Rock. We came upon this storm with a large, rotating mesocyclone southeast of Allison. At this point, I thought this was this was the storm that was going to give us our tornado. We had strong inflow, a couple nice inflow bands, and a slowly rotating mesocyclone and the storm had a solid 55k foot echo top. We followed the storm as it produced a rotating wall cloud south of Shell Rock, but eventually it began to gust out and produced a beautiful shelf cloud near Readlyn. At this point near sunset, the show was over so we let the storm core us as we sat in a church parking lot in Oran and encountered quarter size hail in the process. Although no tornadoes and a typical letdown in eastern IA, it was fun considering that we were not even expecting to chase in the first place!